When it rains, does water stain your walls or ceiling around the chimney? The joint between the roof and the chimney is highly vulnerable to water seepage, especially in Pacific Northwest climates where there are a lot of freeze/thaw cycles. Chimcare offers flashing repair services to seal your home against moisture at one of its most vulnerable spots – the chimney flashing. 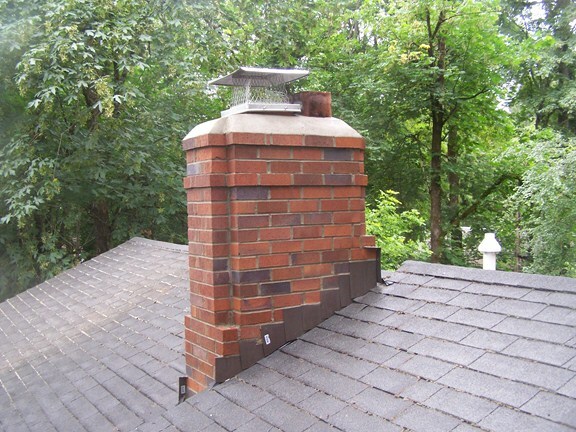 Chimney flashing is used to create a boundary that is resistant to the contracting and expanding of materials that happens due to exposure to moisture. If your flashing is compromised, you will have an increased risk of developing wood rot, mold, and costly structural repairs to your home. When it’s installed, flashing is crucial for the protection of your brick chimney from moisture. It is a waterproof material that is carefully laid to direct water away from the construction seams. Flashing should cause water to drain correctly from your gutters to the ground and prevent rainwater from running down the chimney into living spaces, where it can damage ceilings or walls, and/or cause rot in rafters, joists, or other structural elements. 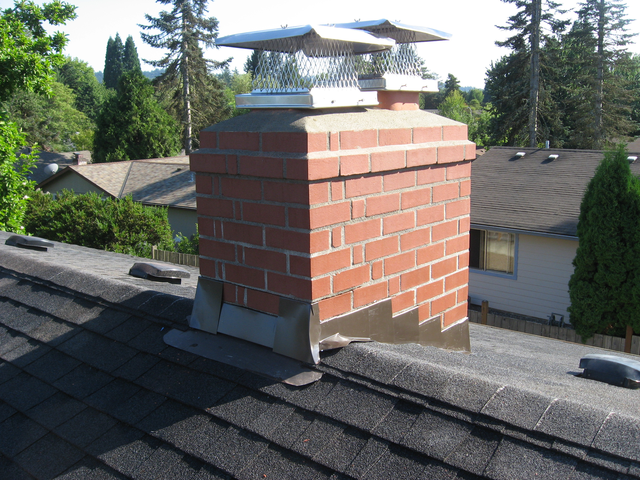 Simply put, flashing is the seal between the roofing material and the chimney. The most effective flashing is made up of two elements, the flashing and the counter-flashing. The base flashing is an L shaped piece of metal extending up the chimney side and under the roofing shingles. The counter flashing, which overlaps the base flashing, is embedded and sealed in the chimney’s masonry joints. This dual-element flashing allows both the roof and the chimney to expand or contract at their own rates without breaking the waterproof seal in either area. Our flashing repair services will seal your home against rainwater and the damage it brings, creating a protected and waterproof barrier and reducing the risk of costly repairs to your home.